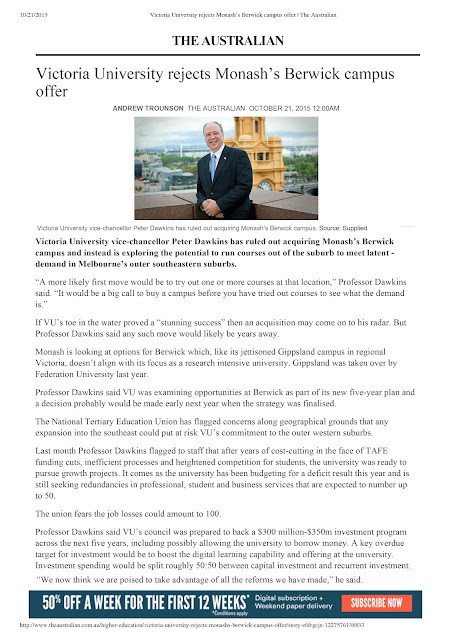 There has been an article released today through The Australian entitled "Victoria University rejects Monash’s Berwick campus offer", written by Andrew Trounson. Please do not see this as VU no longer considering a presence at Berwick. The discussions between Monash and VU relate to VU leasing the campus, not buying. At this point, should VU move onto Berwick campus, it looks like a 2017 date. Please note, there is no way to know this for certain, as VU is yet to make a final decision. Again, I would like to reiterate that Monash has committed to all Monash Berwick students will complete their degrees at the Berwick Campus, remain Monash University students, taught by Monash staff, with Monash services. This will have a cut-off date, which will most likely be longer than the timeframe of the courses as all teach out periods do, but students will then be offered options at other campuses. After meeting with Monash's Vice Chancellor, she reiterated that there has been no final decision about VU moving to Berwick. We have also had confirmed that if VU does not move into Berwick, Monash will pursue other partners as Monash is concerned about tertiary education in the south-eastern suburbs, particularly in pathways and vocational studies. MUBS will continue to ask for answers and help all Berwick students with questions or issues. For further discussion, please contact MUBS President Dani Rothwell on president@mubs.com.au or (03) 9904 7204. Take a look at https://college-homework-help.org/blog/write-essay on various tips, tutorials, how to's and lots of other helpful stuff for every writer.